In a new and dynamic field, everything-you-know-is-wrong papers appear regularly, and no one is too surprised. Usually, once a field of study has been around for a while (twenty years or more, say) most of the basics are settled in, and when an e-y-k-i-w paper comes along there’s either great skepticism or great angst or both. But there are also some long-established fields where paradigms seem to be shattered on a weekly basis. Ubiquitin is one of those. Another universal rule of ubiquitin was disproven recently, and I for one just nodded thoughtfully, unsurprised. It’s particularly interesting to me because it’s yet another example of the important insights into cell biology that arise from antigen presentation in general and viral immune evasion in particular. The paradigm that was overthrown is that “poly-ubiquitination, the process in which a chain of at least four ubiquitin peptides are attached to a lysine on a substrate protein, most commonly results in the degradation of the substrate protein via the proteasome.” (That’s from Wikipedia– my first source for oversimplified summaries that miss important advances and misinterpret what they do find. But other articles on ubiquitin include similar statements.) It’s the “lysine” bit I’m taking issue with in this case. Ubiquitin was identified 30-odd years ago (picture on the left from the Nobel Prize web site). It’s a small, abundant protein that’s found in all eukaryotes, and it’s involved in protein destruction. That’s the last of the firm statements: For the rest of this paragraph, you should imagine every statement to be footnoted or qualified in some way, because throughout the past 30 years ubiquitin has made a habit of constantly revealing unexpected functions and new aspects. The simplest pattern is the one you’ll find in innumerable posters and illustrations (the one on the right is from Sigma-Aldrich, but there are scores of virtually-identical ones out there). 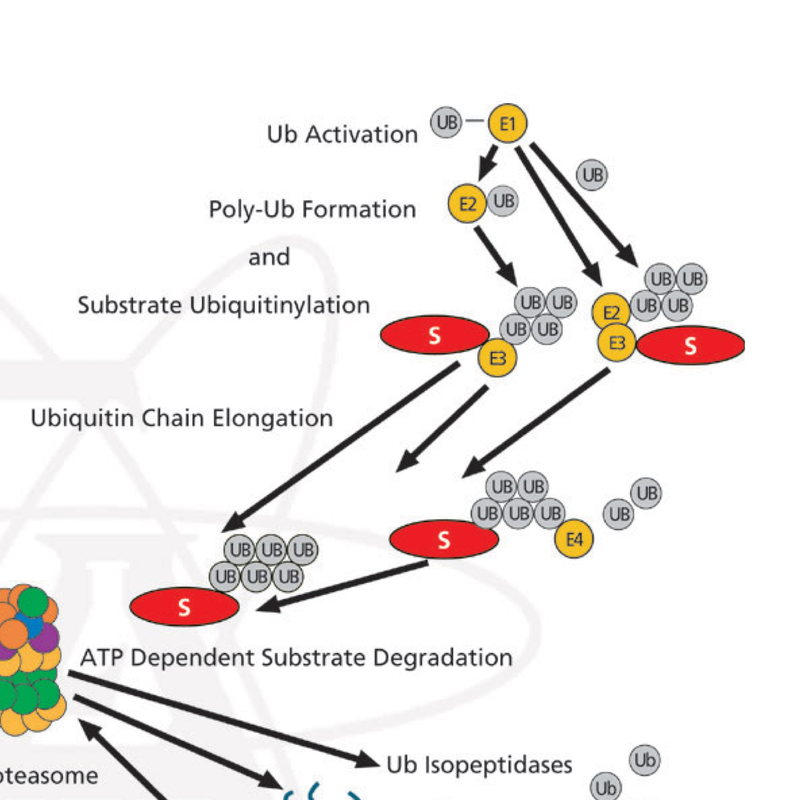 In this pathway, ubiquitin is covalently attached to proteins, new ubiquitins are attached to the original one, a polyubiquitin chain forms, the proteasome recognizes the polyubiquitin chain, and the tagged protein is destroyed, releasing ubiquitin to kill again. It’s one way to put the regulation in your regulated proteolysis. There’s no room here to talk about all of the myriad other functions for ubiquitin that have been discovered over the years, but I want to highlight one in particular. In the mid 1990s2 it was discovered that ubiquitination of cell-surface molecules didn’t necessarily lead to destruction by the proteasome, but rather to internalization and in some cases destruction by the lysosome. What’s more, this receptor targeting mode of ubiquitin often involves polyubiquitin chains extending from ubiquitin’s lysine 63, not 48.3 So already there was precedent for flexibility in ubiquitin linkages. 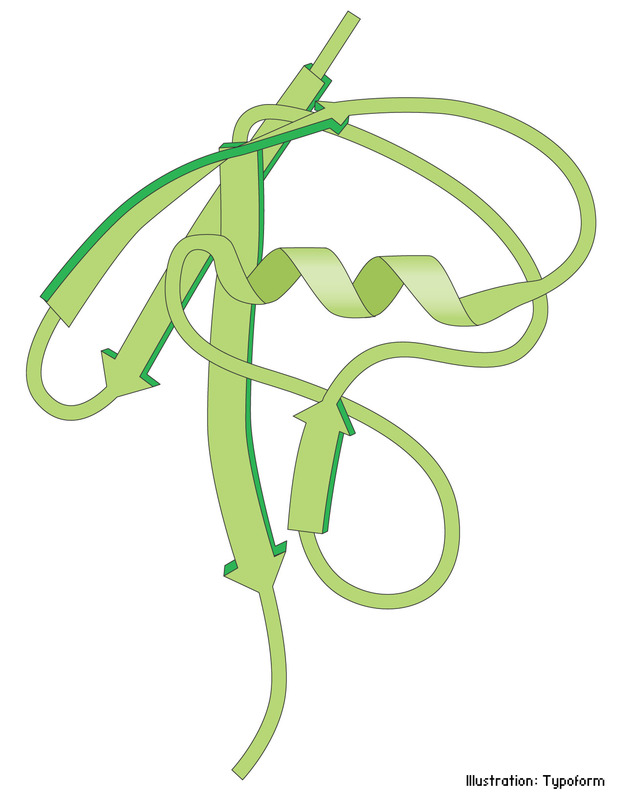 A more recent observation came in the late 1990s and early 2000s, with the unexpected discovery4 that ubiquitin doesn’t even need lysines on its substrate protein; instead, ubiquitin can link up with the amino terminal residue of the protein and form a polyubiquitin chain there. Wang et al, in the paper I’m highlighting here, take this one step further. They were looking at the way mK3 (a viral immune evasion molecule that causes class I major histocompatibility complexes to be rapidly degraded by the proteasome) causes degradation of MHC class I molecules. To make a long story short — hey, you should read the paper yourself! — they mutated all the lysines in the substrate protein and still saw polyubiquitination and degradation. But when they removed threonines and series — amino acids that are supposedly inaccessible to ubiquitin tagging — then the protein was no longer polyubiquitinated, and was no longer degraded. This seems to be a novel chemical process for ubiquitin, too, not involving the usual amide linkage but instead involving an ester bond. It will be interesting to determine whether other ERAD pathways involving transmembrane protein substrates might also involve tail ubiquitination using non-K residues. Furthermore, the fact that mK3 has numerous viral (including MIR1) and cellular homologues makes it attractive to speculate that other ubiquitination-regulated processes use similar nonconventional methods of Ub conjugation. Ian, again, a great Post! Exactly the kind of thing I planned to do when I started my own blog. Now it turns out that the more I work about ubiquitin during everyday work, the less I feel like blogging about this subject. Good do see that other people fill this niche much better than I could ever do! I don’t think that this effect (if true at all) is very widespread. I have heard several people talk about mutating all lysines with the expected result of abolishing ubiquitination. I donâ€™t think that this effect (if true at all) is very widespread. I have heard several people talk about mutating all lysines with the expected result of abolishing ubiquitination. I certainly don’t think it’s universal, but I have heard from two people who have mutated all their lysines without eliminating degradation — one of them still saw ubiquitination, the other hadn’t tested. Neither had published, partly because they were sure they had done something wrong. So I’m sure there’s a publication bias here. Ted’s paper should be high-enough profile that it might drive some of the less confident people out of the woodwork. I’d guess that the next two years will give us a better idea how common this is. If no, or very few, instances are published in that time then I’ll be comfortable that it’s rare. Right now, I’m on the fence.